Sometimes, cooking at home can help clean out the fridge of old food and also create a not so healthy lunch. And it’s a bonus when it’s snowing outside and no one feels like going out for lunch. Dennis made pizza from the dough I bought Friday, and the red bell pepper that I asked asked my mom to buy like weeks ago. 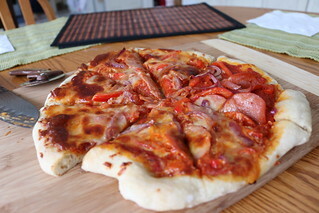 It was delicious, not complaining but home made pizza is affordable and quite easy to make. 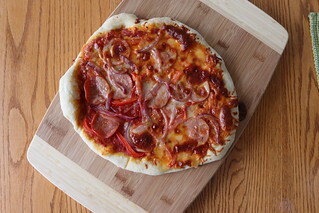 I always like cooking at home, besides the affordability, but sometimes it’s healthier, definitely not today’s pizza though. HAHA!